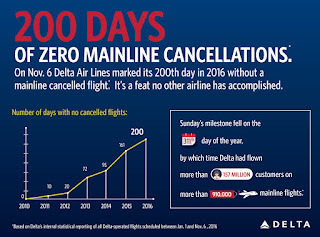 On Sunday, Nov. 6, Atlanta-headquartered Delta Air Lines did what no other airline has accomplished: it reached 200 days in a calendar year without canceling a single mainline flight. The run to the new record began on the first day of 2016, which perhaps foreshadowed how the rest of the year would go. Jan. 1 came and went without a mainline cancellation, a feat that was repeated Jan. 2 and again Jan. 3. Now, with nearly two months left in the year, the carrier reports it achieved the record of 200 days without a single mainline cancellation on Nov. 6. By that date, which was the 311th day of the year, the airline had operated 910,000 mainline flights. While airline leadership is understandably proud of the achievement, it is a feat that just a few short years ago, even Delta (NYSE:DAL) leaders themselves thought nearly impossible. Claiming the record brings renewed meaning to the airline’s post-merger, "Keep Climbing" ad campaign which promised to “Build a better airline, not just a bigger one,” according to the carrier. 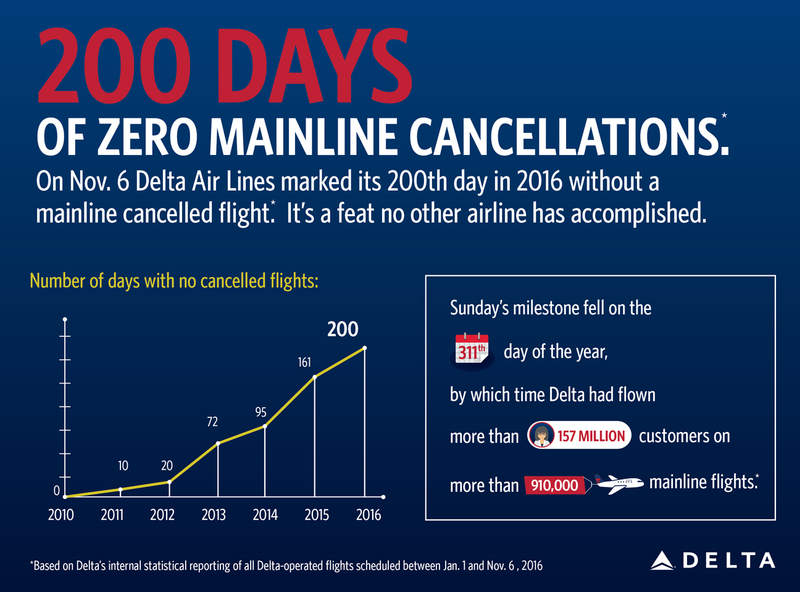 To put the new record into context, Delta had no cancel-free days in all of 2010, just 10 in 2011 and 20 in 2012. 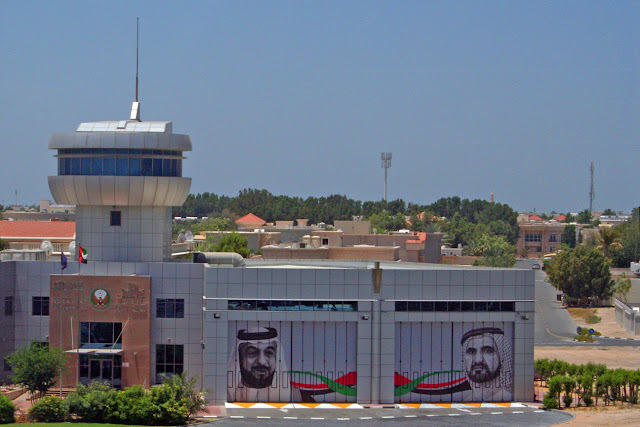 In 2015, the airline reached 161 days without a mainline cancellation. The performance figures do not include regional partners that operate under the Delta banner: ExpressJet, Compass, GoJet Airlines, Endeavor Air, Shuttle American and SkyWest Airlines. Delta had two days of cancelled flights in August but rebounded quickly, as previously reported. For the month as a whole, however, Delta cancelled 1,807 of its 84,540 scheduled flight operations, or 2.1 percent, the second-highest rate of cancellations that month. Despite the challenges it faced during August, Delta finished fourth in on-time performance for the month after claiming the bronze medal for the first two quarters of 2016. The carrier had on-time arrivals at all of the airports it serves of just under 80 percent, behind Hawaiian Airlines (NYSE:HA) at 92.6 percent, Alaska Airlines (NYSE:ALK) at 87.8 percent and partner SkyWest Airlines at 81.5 percent. United Airlines (NYSEL:UAL) was No. 6 in August at 77.5 percent while American Airlines (NASDAQ:AAL) was No. 10 at 71.9 percent. As I said in a previous article, Delta seems to be ‘getting it’, and has come a long way over the last few years in terms of performance as well as its reputation with the flying public. 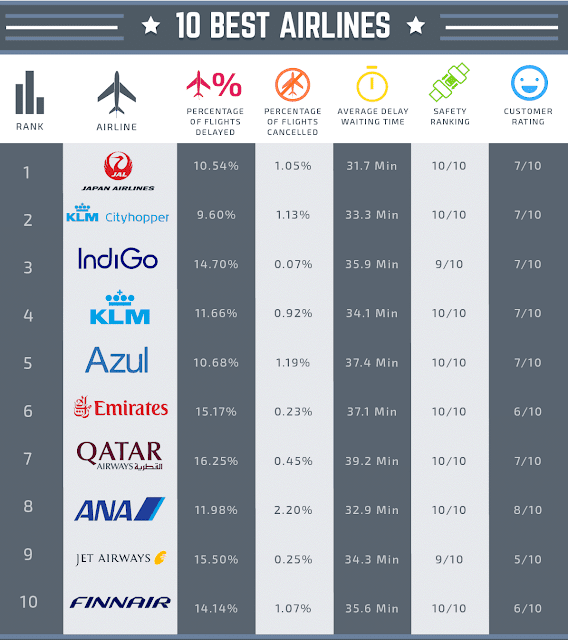 From 2015 to 2016, the carrier moved up 10 points on the SKYTRAX list of The World’s Top 100 Airlines. 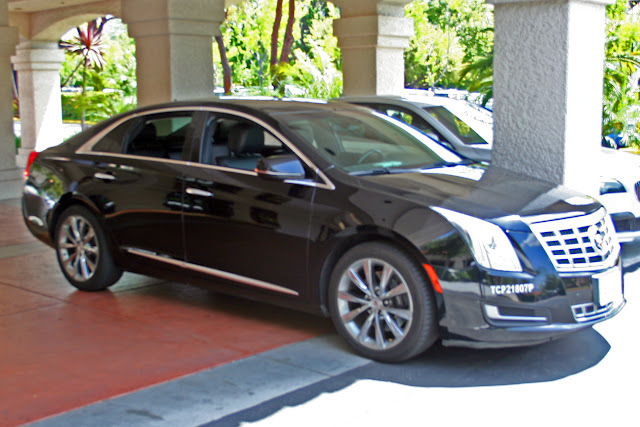 It is also the U.S. carrier that derived the smallest percentage of its revenue from those á la carte services that many passengers refer to as “nickel-and-dime” charges, well behind United Airlines (NYSE:UAL) and American (NASDAQ:AAL). As I opined recently, the carrier’s increasingly positive reputation and its keeping á la carte charges in check may even be related. U.S. airlines, particularly the other two legacy carriers, need to pay attention to what Delta is doing and how it is being received. From my perspective, the airline is making improvements that, for the U.S. airline industry as a whole, are long overdue. Unfortunately half their flights at airports like IND and DCA are regional jets (other companies). While you are correct, the feat is still quite impressive given that its mainline operation operated nearly 85,000 flight ops in August alone.